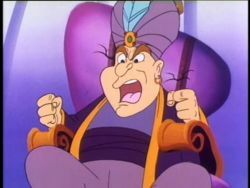 First appearance "Mario's Magic Carpet"
Sultan Pasbah is a short, obese man and is apparently the ruler of an unnamed desert region, as evidenced by his sultan title and palace. In The Super Mario Bros. Super Show! episode "Mario's Magic Carpet" Sultan Pasbah, after Mario, Luigi, Toad and Princess Toadstool land in his palace due to one of his traps, has them all taken captive. Having Mario, Luigi and Toad taken to his slave's quarters, Sultan Pasbah has Princess Toadstool taken to his harem. Eventually, Sultan Pasbah becomes annoyed by Princess Toadstool constant acting out and puts out an advertisement for her, planning to sell her to the highest bidder; that bidder eventually manifests itself as King Koopa. As Sultan Pasbah and King Koopa continually debate over the price of Princess Toadstool, they are overcome by the stench accidentally conjured by a genie, Mario, Luigi and Toad, who had escaped; King Koopa, apparently seeing his chance, steals Princess Toadstool away from Sultan Pasbah while he is distracted by the horrific odor of the genie. This page was last edited on January 28, 2019, at 03:12.